So we have the tom tom, the necklace, the headdress, and now the final part of the ensemble, the vest. This one has a little more prep work than the other crafts. 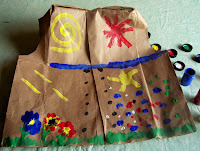 We don't always get to this one because of time constraints, but it is really cute, and you may enjoy making in with your little Native American. paint, markers, scrap paper, etc. First you take a brown grocery bag and cut it all the way up the middle of the front or back. On the bag bottom you cut out a circle which will be the top of the vest. Then about 1 1/2-2 inches from the bag bottom, cut out circles for arm holes. This part is probably all parent or teacher work. I also turned my brown bag inside out after I cut the middle and the hole for the head as there were lots of words on the bag. If you need bags check with your local grocery store. Our local Giant store told us whenever we needed brown bags to come see them. 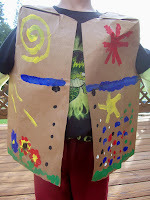 The next phase of the vest is decoration.. This can be done anyway you please. I used tempera paint. When using this type of medium, you can't do the front and the back at the same time. One side would have to dry before the other side could be done. 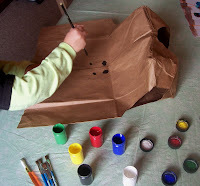 You can also use markers or scrap paper and glue. Use anything that you think would make it look great. Also, you can add fringe at the bottom by just letting the children use the scissors to cut around it. (I think my three-year-old class would love this part--they love to "fringe" all their papers). Now our Native Americans are all ready for our big show next week. Give these a try and you could have some Native Americans joining you for your Thanksgiving Feast.